Buy through MusicWeb from £12.49 postage paid. This recording is designed to promote The Sage as a venue - and it more than fulfils this aim. This is a truly exciting recording of excellent quality. Freshness and life pervade these well-known works and the sound quality can only be described as stunning. The partnership between Austrian-born director/soloist Zehetmair and the resident orchestra is a vibrant success; the acoustic is superb. Both works are well known and substantial. the disc is good value in terms of content as well as quality. The Brahms is especially lovely - warm, full, rich sound which typifies this composer's best works. Its sound-world is strongly reminiscent of the Second Symphony - written in the same place - the mountain resort of Portschach - in Carinthia) only a year earlier. Although this work is already well represented in the recording catalogue, I have very much liked this particular performance. The work has a strong role for the orchestra, as well as the soloist, and the Northern Sinfonia's playing is more than equal to this. Zehetmair's contribution is considerable; he has edited a revised edition of the score, in addition to adding his own cadenza. This makes the concerto a hard act to follow, but the Schumann is also very good. A more measured work, this is solid and steady but never heavy or portentous. My only reservation is that perhaps the brass is a little strident in the first movement. Both oboe and violin excel in the second movement. The finale skilfully combines pace with lightness of touch, reflecting well on Zehetmair's abilities as a conductor as well as soloist. 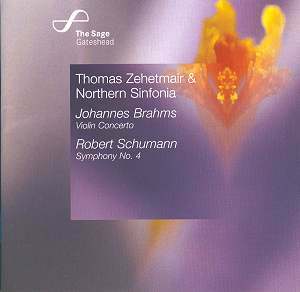 This disc is a fine advertisement for the quality of playing - and indeed the acoustic - to be heard at The Sage. Were I still living in the North of England, it would encourage me to visit this splendid new concert hall. As this is no longer so, I shall be looking out for other recordings from this talented combination.